It’s a design I have not seen before. Starting at the bottom, there is a fringed cuff to be found, and not a single corrugated rib in sight. The customary wrist inscription goes all the way around and reads “G. Walton 1846”. 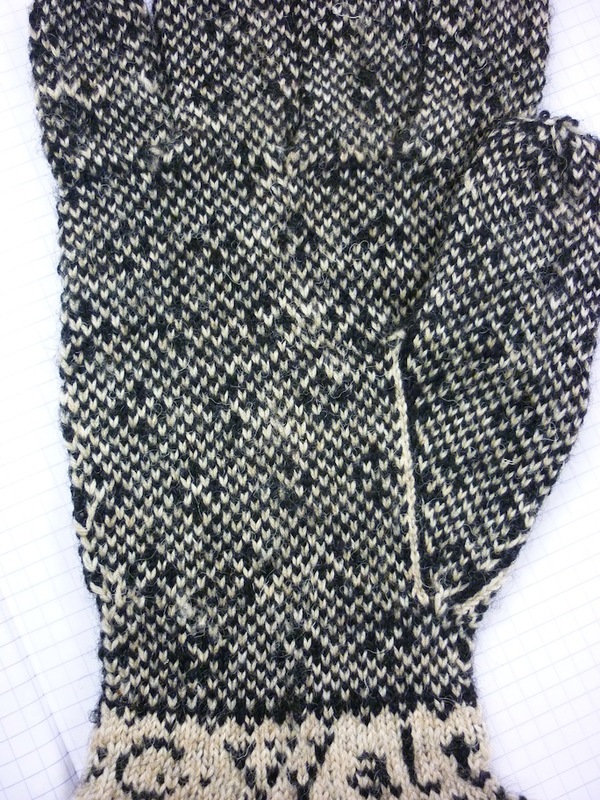 The bands separating the inscription from the other parts of the glove are made of small peaks. The back of the hand shows three prominent zigzag bands with small diamonds. The main pattern looks like a variation on the midge and fly, and it’s very handsome too. As you can see, the thumb gore is outlined in both a white and a black stitch. 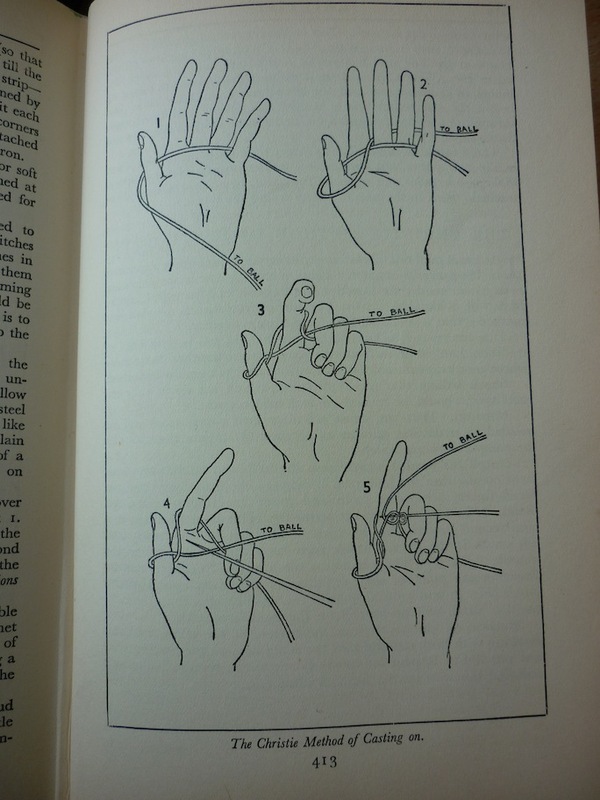 The increases are made inside these two stitches and they are evenly spaced up to the base of the thumb. 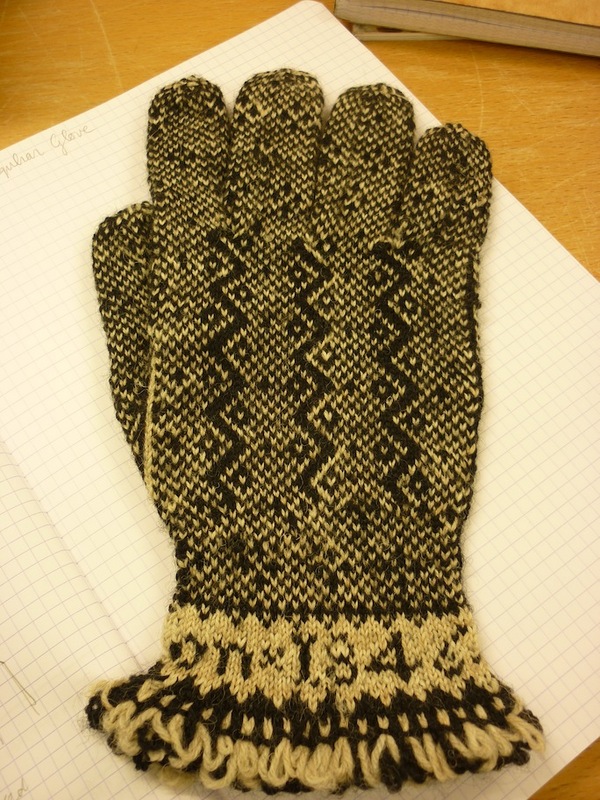 It is knitted in wool in natural white and (dyed?) black, and the tension comes in at 12 stitches per inch. 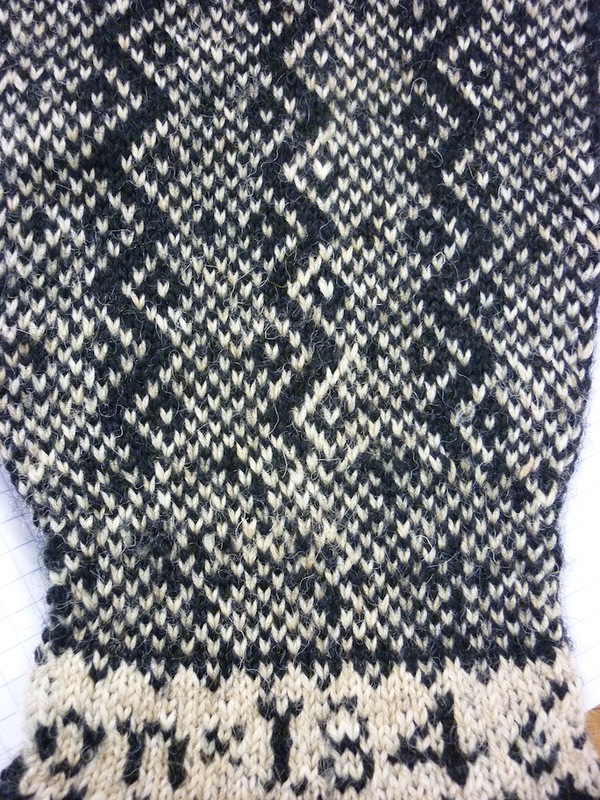 I didn’t take pictures of the other Sanquhar gloves, as they were in the, dare I say, ubiquitous Duke pattern, although they were also incredible feats of knitting, with a guestimated tension of appr. 20 spi! 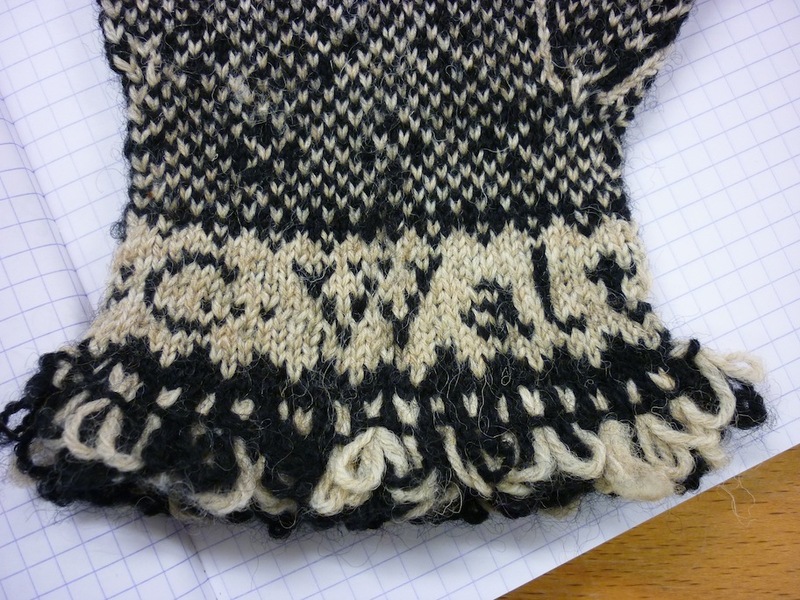 ERRATUM, added 24 July 2011: after sharing this blog post with the Sanquhar Knitting Group on Ravelry, it soon transpired that this glove is not a replica of a Sanquhar glove, but of a Yorkshire Dale glove, which explains all the differences I noted. Rutt found the original in the Wordsworth Museum in Grasmere, but I don’t know if they are still there. 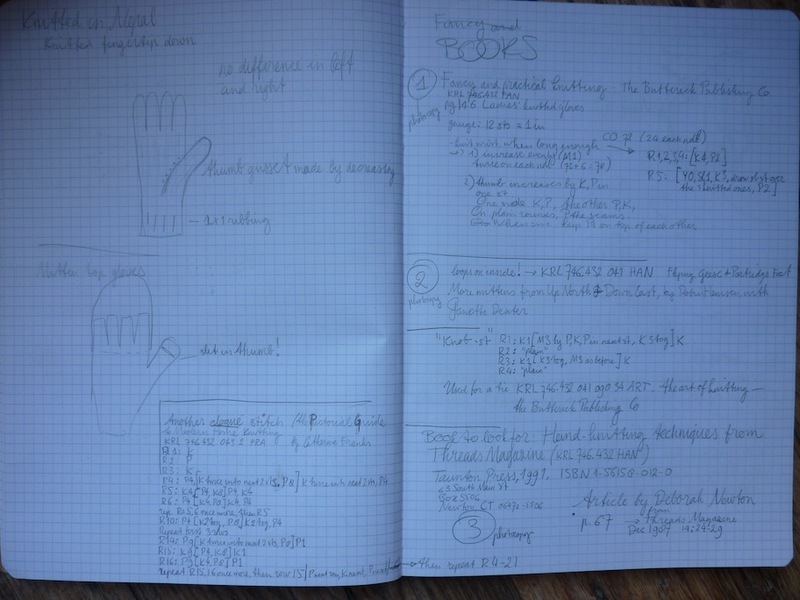 And in fact, there is a photograph and a pattern graph in Rutt’s A History of Hand Knitting (pages 123 and 124 in my edition of the book, which is an Interweave reprint). On the way home I got chatting to a lovely lady, who was an avid knitter herself, and perhaps even more exciting: an expert cake baker! She carried a cake she made for one of her grandsons, and it was in the shape of a treasure island, complete with palm trees made from Flakes, a Lego rowing boat and a here-is-the-treasure-hidden cross made from chocolate. She told me a bit about her travels when she was younger. She taught English in Nepal, Hong Kong and other places when she was, erm, somewhat younger. And then we talked about that amazing cake again and it’s a tradition now that she makes a cake for each of her seven grandchildrens’ birthdays. They love their gran’s special birthday cake so much they give her designs nine months in advance!